Bill Cunningham: Facades explores the legendary photographer’s project documenting the architectural riches and fashion history of New York City. In 1968, Bill Cunningham scoured New York’s thrift stores, auction houses, and street fairs for vintage clothing. He generated a photographic essay entitled “Facades.” The project paired models—in particular his muse, fellow photographer Editta Sherman—in period costumes with historic settings. By showcasing fashion in the context of architecture, Cunningham traced the evolution of aesthetics from colonialism to the rise of modernism in New York City. More than 80 original and enlarged images from Cunningham’s whimsical and bold work will be on display to offer a unique perspective on both the city’s distant past and the larger cultural zeitgeist in late 1960s-70s New York City, an era when historic preservation and urban issues loomed large. "Facades at Rosehill" at Newport, Rhode Island runs from December 2, 2018 to March 1, 2019. Bill Cunningham turned fashion photography into his own branch of cultural anthropology on the streets of New York. He chronicled the era’s ever-changing social scene for The New York Times by training his busily observant lens on what people wore — stylishly, flamboyantly or just plain sensibly. 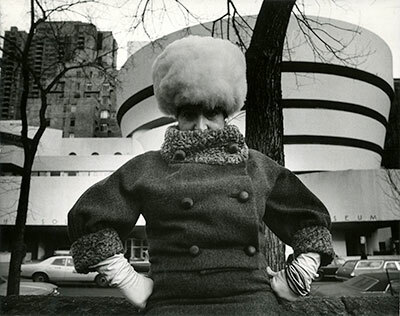 Bill Cunningham's iconic photo of Editta Sherman is featured in this article. A recent New Yorker piece highlights Editta Sherman, as Bill Cunningham's favorite muse. Bill Cunningham's "Façades" brings together 128 of the best architectural settings and fashion. Bill, rest in peace. Your life has been more than a picture for so many of us. 'We see that she has caught a few hard grains of time it self. Life is something pinned down by life and light. Her portraits are forever'. Yul Brynner, Christopher Plummer, Leonard Bernstein, Maurice Chevalier, Joe DiMaggio, Leopold Stokowski, Lillian Gish, Anthony Quinn posed for Editta.